Students will be completing both a water-related ecosystem and a dry-land ecosystem flap foldable as we move through the next lessons. Chose one of each type of ecosystem and stick to it like: an ecosystem in the Sahara Desert, on a Carribean Island, or in Alaska. Students are encouraged to use magazines, drawings, stickers, colored pencils, construction paper, sketches or pictures off of the internet as they complete their Ecosystem Flap Folders. We anticipate learning a lot more about diverse ecosystems over the next few lessons. 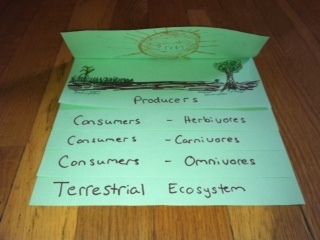 Encourage students to add to their foldables as they learn about a new animal located in the ecosystem they choose. This is the producers page. 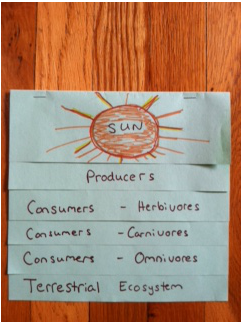 Producers, Consumers, Herbivores, Carnivores, and Omnivores. 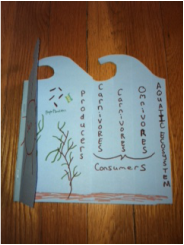 Each flap includes plants and animals that make up each level on the energy chain included in an Ecosystem progressing from producers( top) to consumers- including herbivores, 1st level carnivores, 2nd level carnivores, and omnivores to the final flap(bottom) that displays a drawing that represents an ecosystem. See examples of an Aquatic Ecosytem Flap Foldabe a student might do below.